*REQUIRED! Choose Your Mattress Thickness, Depth or Height Mattress Depth 3" Mattress Depth 4" Mattress Depth 5" Mattress Depth 6" Mattress Depth 7" Mattress Depth 8" Mattress Depth 9" Mattress Depth 10" Mattress Depth 11" Mattress Depth 12" Mattress Depth 13" Mattress Depth 14" Mattress Depth 15"
California Queen Platform Bed Mattress size is approximately 60" wide by 84" long. This Bed Bug Mattress Encasement will actually encase and enclose the mattress fully, completely protecting the mattress from bed bug infestation. OPTIONAL PILLOW ENCASEMENT'S are available above. 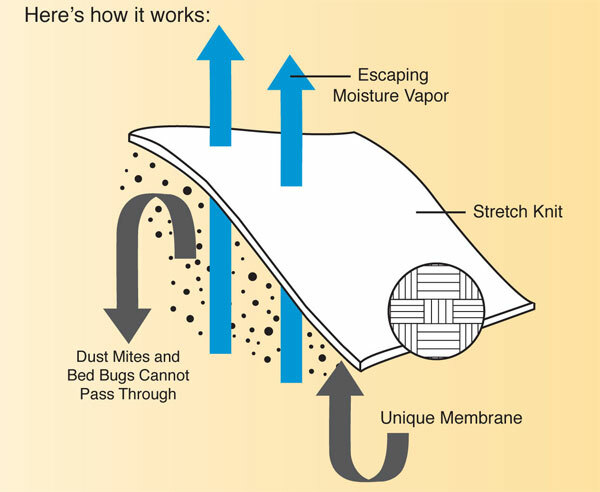 They are constructed of the same bed bug proof and dust mite material as the mattress encasement and are recommended. California Queen Platform Bed Mattress Encasement Protection from Bed Bugs and Dust Mites. 100% allergy and dust mite protection. Sewn in the USA.